The Internet is used by 75% of American adults to search for health or medical information online; 1 in 10 are searching for health information right now as you read this . Indeed, the amount of information available on the Internet related to health and medicine is staggering. While much of it is credible, an equal or greater amount of misinformation also exists. Reliable sources of health information are extremely important to online health seekers. Enter iMedix, a health 2.0 service that combines a healthcare search engine and social networking. iMedix provides health consumers a way to find medical information that has been filtered for reliability and rated by patients with similar interests. The iMedix website makes it easy to transition between a reliable health web search, questions and answers asked in iMedix health communities and iMedix members — all with a single click. Why use iMedix to search for health information instead of Google? Simple … reliability of search results. iMedix is a community-powered healthcare search engine, which combines a vertical health search engine with a patient-to-patient social network. iMedix uses proprietary algorithms to evaluate healthcare websites and rate top sources. Dozens of thousands of websites that are approved by top medical accreditation organizations such as HON (Health On the Net Foundation) or URAC (Utilization Review Accreditation Commission) are cataloged by iMedix. Individual site accreditation is indicated in the search results along with a clear indication of the source of each article. The iMedix community then provides feedback by rating those sources, further improving the ratings. Thus, users benefit from the collective medical knowledge and experience of the iMedix community. 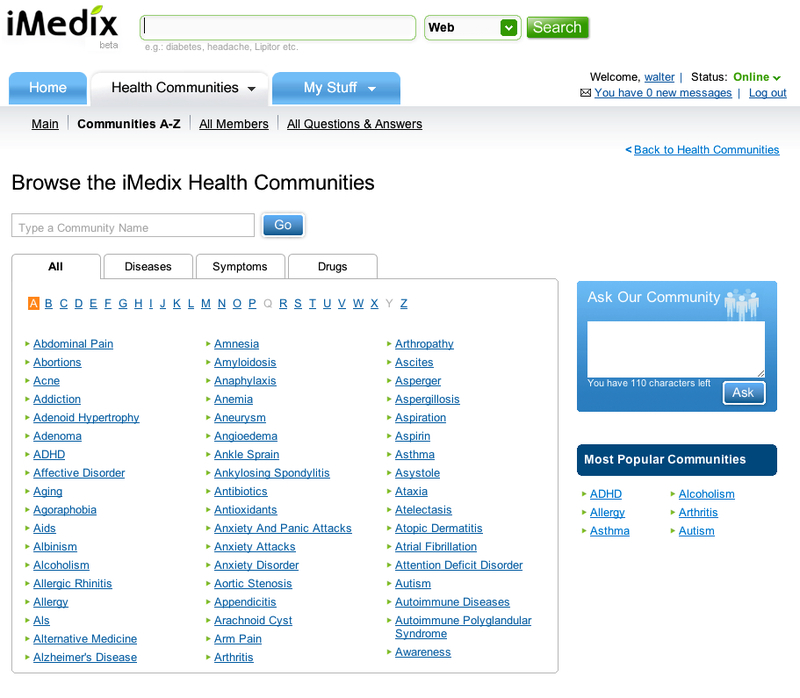 To the right of the web search results, several members of the iMedix health community associated with the search term are shown. Community members can also be searched by selecting the “Members” link at the top of the search results. The right sidebar also displays questions related to the search term, making it easy for users to transition from a web search to searching questions and answers posted by the iMedix community. Questions and answers can also be searched by selecting the “Q&A” link at the top of the search results. These three sections — web results, questions and answers, and iMedix members — are transposed with the user’s selection. If the user chooses web results, community members and related questions are shown in the sidebar. If the user chooses community members, related questions and web results are shown in the sidebar. iMedix thus allows a user to take a search term and, with one click, query three different data spaces. The iMedix search engine supports the “AND” operator, allowing for complex searches with multiple parameters. Although you can use the iMedix search engine without signing up, you won’t be able to communicate with iMedix members nor ask or answer questions from the various health communities. Although iMedix began as a blogging platform for patients, it has evolved into a patient-to-patient social network. iMedix health communities enable people to share and discuss their health issues with others. Currently, there are ~2000 communities, which iMedix plans to consolidate in the future. Popular communities are shown on the iMedix homepage. Users can easily sort health communities by disease, symptom or drug and browse them alphabetically. iMedix users can “tag” themselves by indicating health interests in their profile. Many tags are used by iMedix to assign users to health communities, connecting them to other members with similar interests. Additionally, users can browse member profiles to find other users that share a health interest. Asking a question is as simple as typing it in the “Ask Our Community” box on the right side of the page. The iMedix system extracts keywords and tags, and immediately distributes your question to relevant members. Questions and answers are moderated by community leaders as well as by the community itself. iMedix notifies you as soon as you receive answers to your question. Each answer that is given to a question can be rated by other users, giving it a “thumbs up” or “thumbs down”. Individual answers can also be reported for abuse. I found user answers to be a mixed bag. Some answers were informative while others … not so much. As with any social network, you take the good with the bad. Like other online social communities, users can “friend” other members, adding members that they find interesting or well informed to their friends list. What was notably absent was conversation. People with health problems want to talk and share with others that have similar issues. If you’re familiar with Internet forums or messages boards, you’ll be disappointed in the lack of such an application on the iMedix website. However, iMedix users can chat in real time or send offline messages to one another through a private messaging system. There may be an abundance of conversation between patients, but none of it is publicly accessible. For those internet users who are supplementing their doctor’s advice with health information found online, search is the first stop for most e-patients. Search is the de facto second opinion in the United States and search results often include user-generated content such as blogs, discussion groups, and Wikipedia. Social media is not just stumbled upon by searchers; it is a starting point for many people. This trend is hard to measure since a lot of user-generated content has become “wallpaper” technology for many people — they absorb it without noticing it. But community is powerful and always has been. Technology makes this basic instinct easier to fulfill. I’ve written previously about the Trust and Credibility of Healthcare Blogs. Indeed, I think about the credibility and reliability of internet-based health information all the time. It’s the principle reason why I include links and list references in all my articles. Although presentation trumps content online today, I think health seekers are becoming more savvy and looking beyond website design for impartial and verifiable sources of information. iMedix makes finding those sources of information easy. iMedix has been in beta for 10 months. In a May 2008 interview with CenterNetworks, iMedix co-founder and CEO Amir Leitersdorf said that the healthcare-community site had more than 500,000 users each month and, with the help of the iMedix community, had ranked and re-organized more than 20 million health articles . In July 2008, the company announced its first major media partnership and will be powering the search capabilities of PARADE.com’s health section . It will be interesting to see how iMedix develops over the next year as its user base continues to grow and mature. Pew Internet & American Life Project Tracking surveys. March 2000 â€“ May 2008. Pew Internet & American Life Project. Last updated: July 22, 2008. 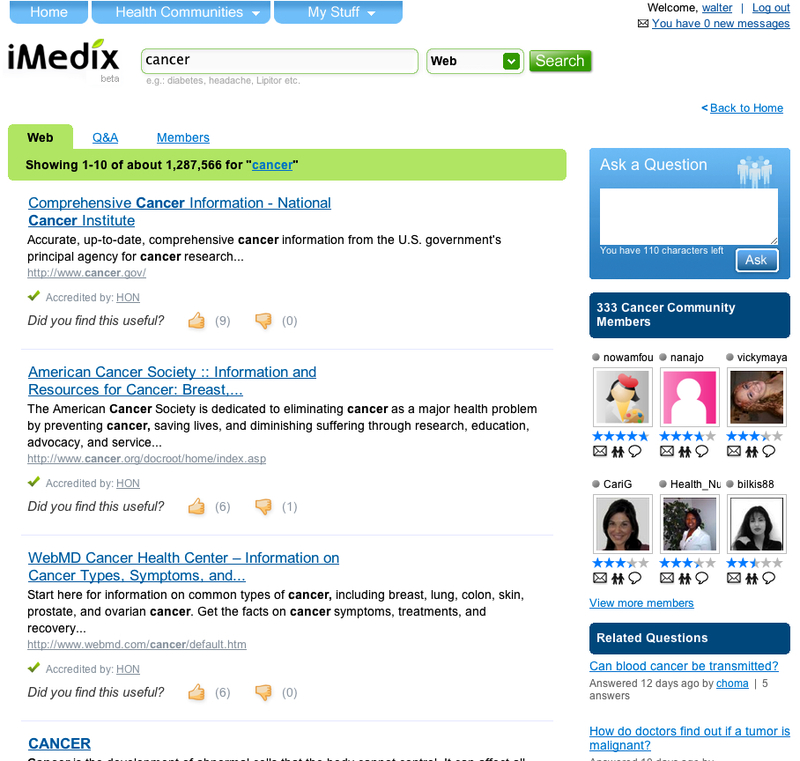 Accessed 2008 Oct 12.
iMedix Unveils Community-Powered Health Search Engine. Reuters. 2007 Dec 10. Interview With iMedix’s CEO Amir Leitersdorf and CMO Iri Amirav. CenterNetworks. 2008 May 20. PARADE.com Partners With iMedix to Enhance Health Portal. Reuters. 2008 Jul 23.